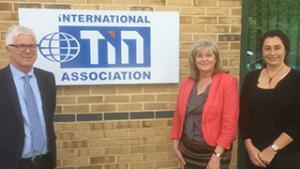 UK Member of Parliament Anne Main has met with the International Tin Association as part of her campaign to highlight the need for greater UK government support of measures to regulate minerals supply chains, ensuring that armed conflict and human rights abuses are not linked to materials used in consumer products. The International Tin Association, headquartered in Anne Main’s constituency, is leading the tin industry approach to the issue through the ITSCI due diligence and traceability programme for tin, tungsten and tantalum in Central Africa. The issue of conflict minerals was initially focussed by NGO campaigns and then US legislation in 2010 calling for companies to carry out due diligence for tin, tungsten and tantalum sourced from the Democratic Republic of Congo (DRC) and other high risk areas according to the internationally accepted OECD Guidance for responsible sourcing in mineral supply chains. The issue of responsible minerals sourcing has now been expanded to a global issue under a new EU Regulation now in force that will implement increasingly strict due diligence requirements for minerals imported into the European Union from 2021. The visit reviewed the flagship ITSCI programme, led by International Tin in Central Africa, that has put in place comprehensive 100% OECD-aligned standards to trace and monitor risks associated with minerals from almost 2,000 mine sites as they are transported to smelters. This involves around 500 field visits per month, reporting and working with local communities to resolve around 1,200 incidents per year related to issues such as human rights, armed groups and corruption. The majority of the programme is funded by the miners themselves, significantly limiting potential for wider social actions to improve governance. Information generated by ITSCI is available to downstream tin using companies, and is used by major electronics brands, to report on their due diligence and ensure that the minerals used in their products are responsibly sourced. The work also means that more than 70,000 miners plus their dependents can access global markets and secure their family incomes. At the same time the ITSCI programme infrastructure is available to support a growing portfolio of projects aimed at improving the well-being of mining communities. Anne Main is the Chair of the All-Party Parliamentary Group (APPG) on Bangladesh and has extensive hands-on experience with issues relating to responsible sourcing of textiles, notably in responding to the Rana Plaza factory collapse disaster in 2013. The visit discussed opportunities to better align UK government support and funding with industry efforts such as the ITSCI programme, potentially giving similar leadership on responsible minerals sourcing.